CONSUMER STYLING ON THE OUTSIDE. ALL BUSINESS ON THE INSIDE. Finally, a flexible business tablet you can customize for just about any job and any environment – from retail associates and warehouse workers inside the four walls to salespeople, delivery drivers and service technicians out in the field. You get the best of both worlds – consumer styling for your workers plus all the enterprise-class features and options you need to meet business needs: enterprise durability, constant battery power, your choice of Android® or Windows®, a rugged frame for extra durability in more demanding environments, two display sizes, GPS, NFC and fast Wi-Fi and cellular wireless connections – 802.11a/b/g/n Wi-Fi with the ET50 and 4G LTE with the ET55. 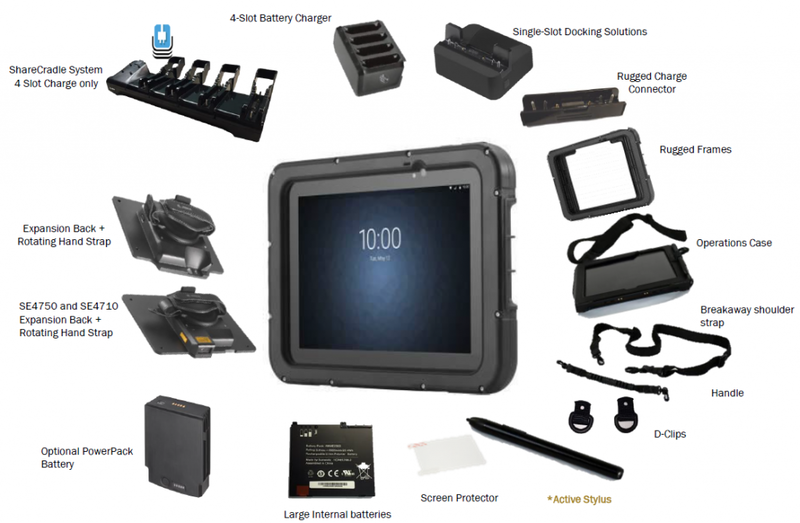 When it comes to data capture, the ET50 and ET55 (ET5x) tablets offer it all – two integrated cameras for image capture, barcode scanning and video calls; optional advanced scan engines and innovative Bluetooth scanners for comfortable intensive barcode capture; and three methods of data entry that work even if the screen is wet – an active or passive stylus or a finger, with or without a glove.